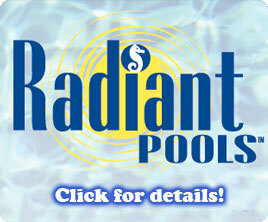 Stonescapes - Clearwater Pool & Spa of Keene LLC. Patios & Decks built to order! Create a private backyard paradise while enhancing your home’s value. Hardscape blocks come in a variety of colors, shapes, textures and sizes to help us design the perfect harmony for your backyard landscape. Adding patios and decks to your existing landscaping is a terrific way to add fun to your lifestyle. Whatever it may be, poolside, dockside, hillside or hearthside, let us help you design and install a patio, deck or firepit for the backyard of your dreams and make it a reality. Call us at 603-357-5874 or visit our store (see map)! Choose from a variety of stone, brick or blocks in a wide variety of color and textures. We will excavate, remove and deliver all materials necessary for proper drainage and leveling for the placement and installation of your walkway. Add a walkway to your hot tub, pool, garage or any other play area or garden. 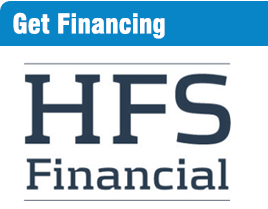 There’s never been a better time to spruce up your property! We will come and do an on-site visit and estimate to determine the best placement of your walkway. We can also add steps or flower bed walls to enhance the existing patio areas. Feel free to give us a call to look at some sample catalogs for the size, color and texture of the block or stone that will enhance your landscape. Retaining walls of any size! 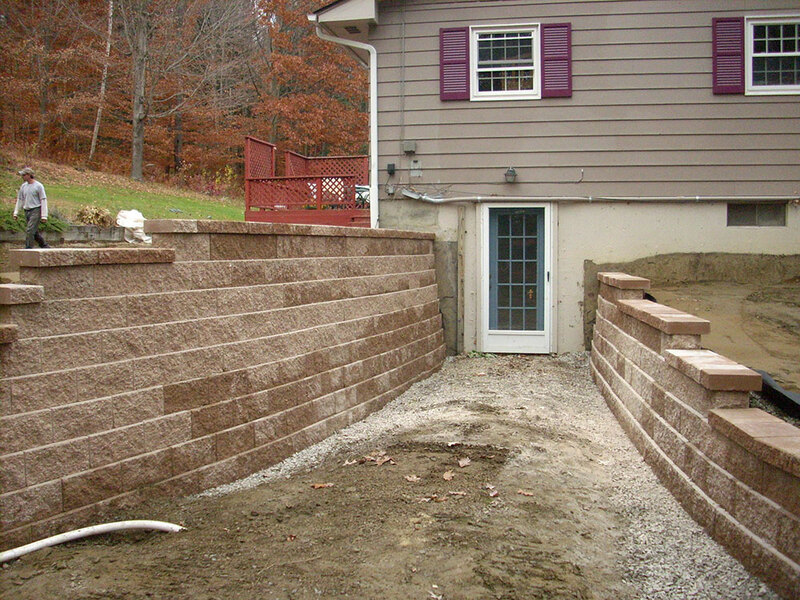 Retaining walls are important in preventing landslides and drain off from your lawn area as well as create a beautifully landscaped area around your pool or spa. They are built to the customer’s needs and can add a very special appeal to a flower garden or backyard. We build retaining walls in compliance with the town or state for approval for in-ground pools, along roadsides, busy highways and lakes. 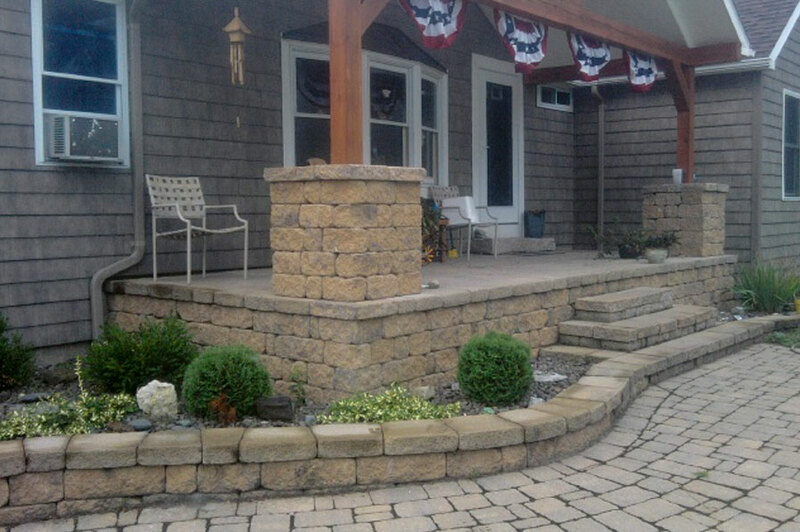 We will build your retaining wall to your specifications in keeping with the lay of the land or landscaping. How about a fire pit? We build them! Enjoy a warm fire in your backyard during an evening swim or soak in your hot tub. Create the perfect poolside barbeque for toasting marshmallows or just relax by the fire. 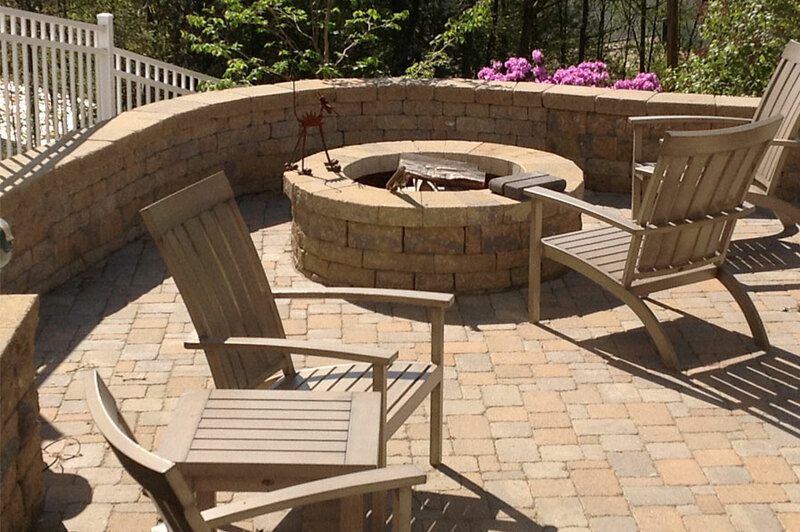 Design your own fire pit with blocks or stone to match your paver block patio or deck! We can build it round, square, above or below the ground, whatever you have in mind.